It was time for another trip to make sure our 5th wheel didn't get rusty sitting in the storage lot. We only had about a week of free time, so we decided to go west on IH-10 and spend a few days in New Braunfels. 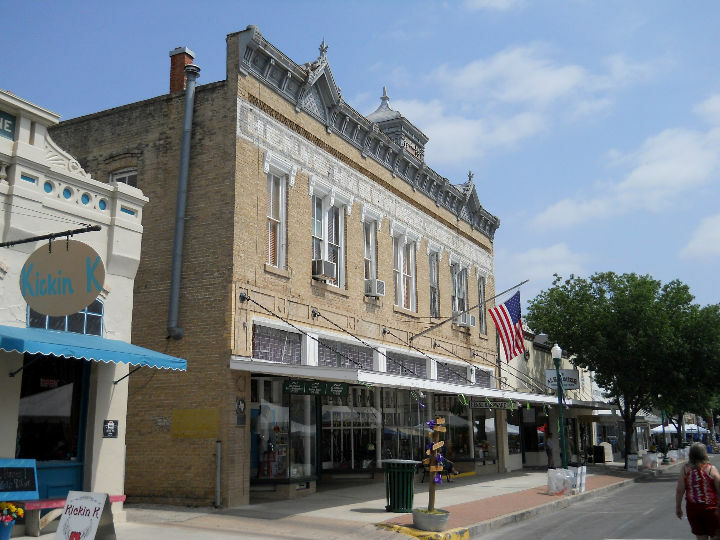 This historic Texas town was founded by Prince Carl of Solms-Braunfels in 1845. His brave group sailed from Germany to the Gulf Coast, then over the Texas plains in search of an area the Spanish called "Las Fontanas" (the fountains). At the confluence of the Comal and the Guadalupe Rivers, they founded a city named after their homeland. Today, the city is an attraction to tourist the world over. We hope you find this account of interest. [Friday] May 4th we left Richmond about 10:00 am headed west on IH-10 toward San Antonio. 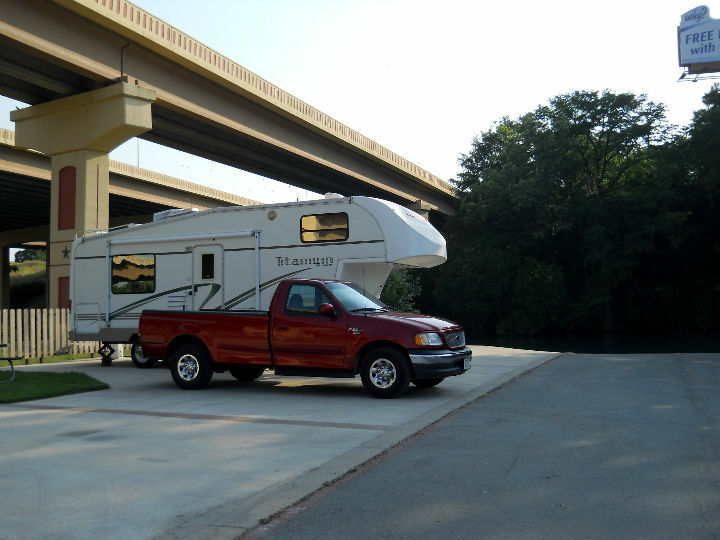 At Seguin, we took TX-46 north to New Braunfels and to River Ranch RV Resort, on the Guadalupe River. We checked into site #20, right next to the river at about 2:30 pm. This park has very modern RV sites and is nice and clean. The only negative is that it is almost under the I-35 bridge over the river. Outside you hear the freeway traffic quite well, but inside with the air conditioner on, we could barely hear it. With the outside temperature in the 90's we won't be spending too much time sitting outside the trailer during the day. [Saturday] In the morning we drove the short distance across the river to the New Braunfels Visitor Center. We picked up brochures on everything of interest and the gentleman was helpful with our questions. Then it was about a mile into the downtown area. 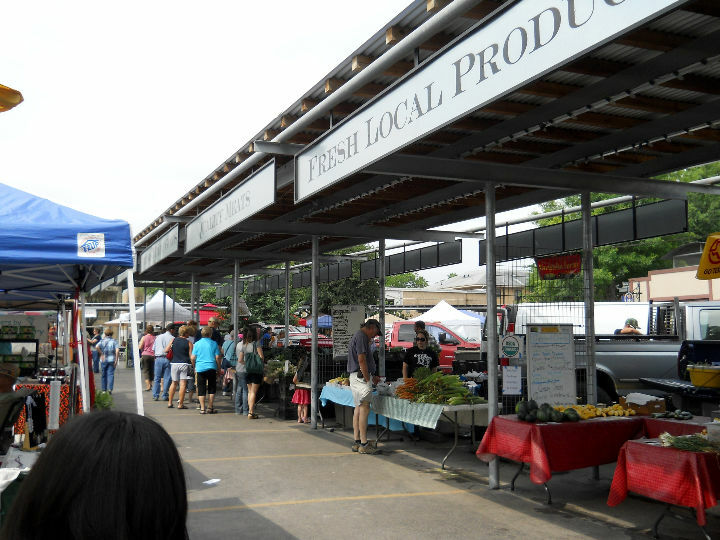 Every Saturday "rain or shine" they have a Farm to Market off Castell Ave. Local farmers had their produce and there were more non-farm vendors than farm. We bought some of the produce. 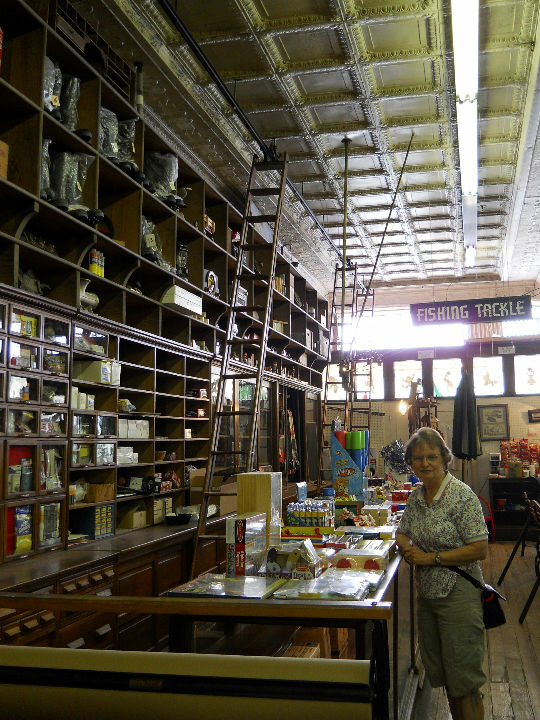 We walked around the area, as well as a wine tasting event area located nearby on San Antonio Ave. We spent some time in the Antique Mall on San Antonio Ave., where Kay found something of interest. We also went into the old Henne Hardware store. It began as the Louis Henne Company in 1857 and 150 years later is still operating today. The old shelves, counters, rolling ladders and trolley system for handling the money are still in place. < < Louis Henne Hardware. After lunch, we drove back downtown and toured The Sophienburg Museum, which focuses on the German colonists that settled the area in the mid-1800s. 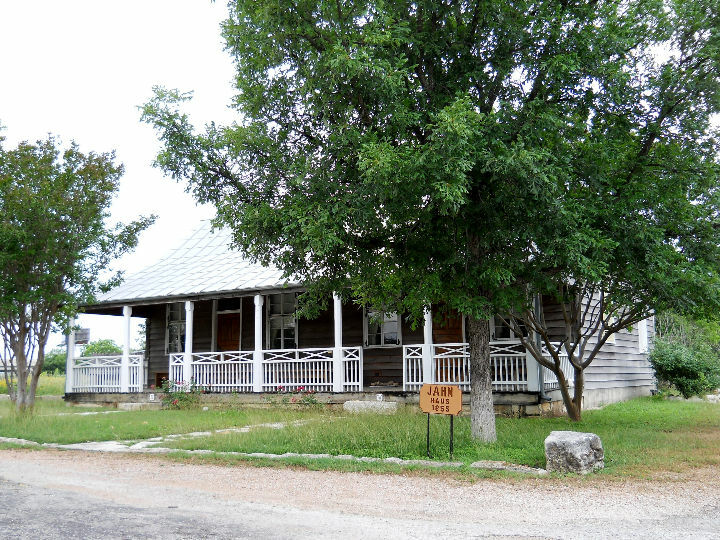 Prince Carl, who's family was from the Braunfels area of Germany named his new settlement in Texas for his home. Although not a large museum, it was very interesting. 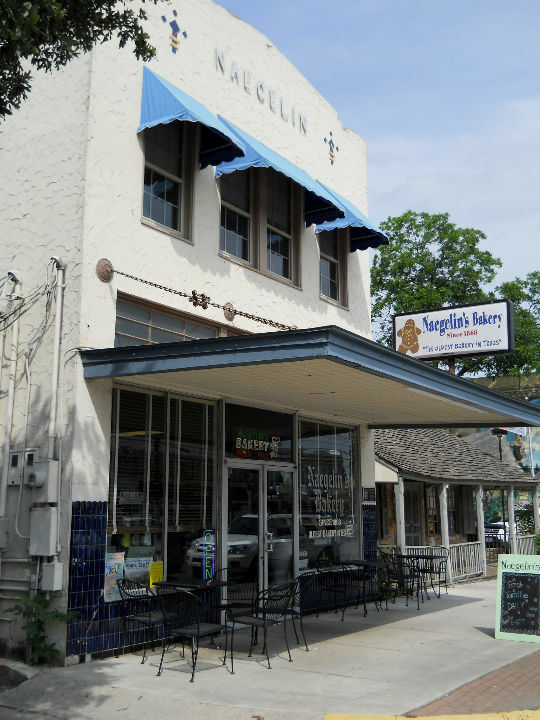 Before we left downtown, we stopped into the Naegelin's Bakery (c. 1868), the "Oldest Bakery in Texas." Good smells in there so we had to purchase a few items. On the way back to the trailer, we stopped by the local H.E.B. store to pick up a few needed food items. 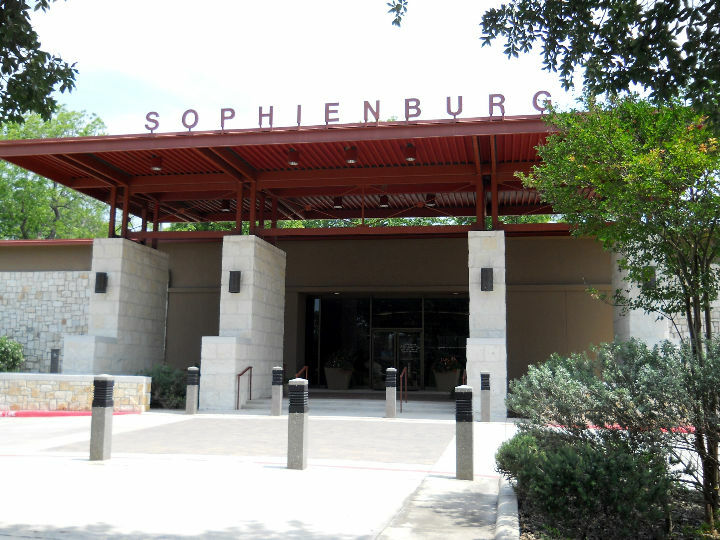 < The Sophienburg Museum. < Naegelin's Bakery. 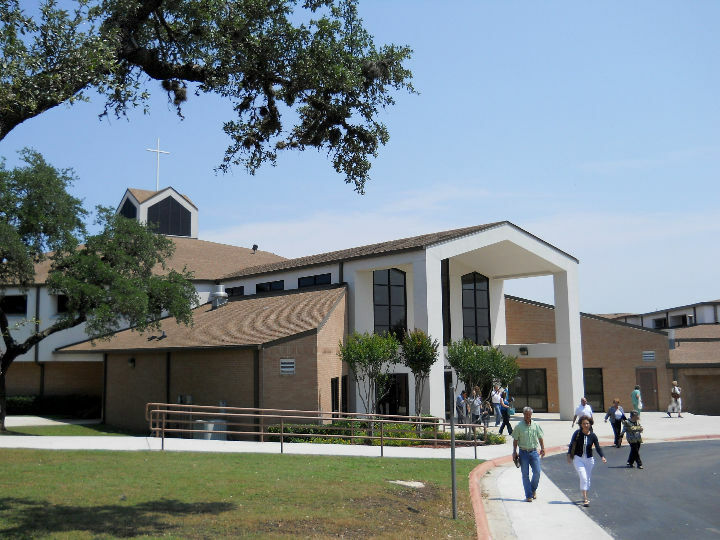 [Sunday] We attended the 11 am worship services at Oakwood Baptist Church. 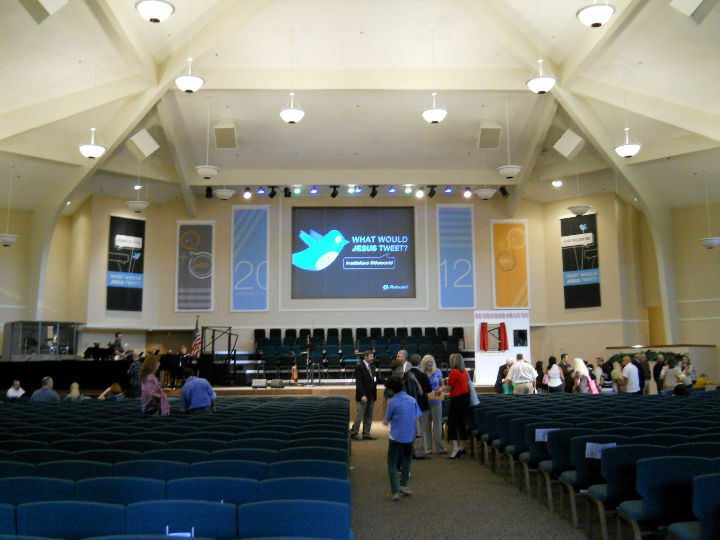 The music was contemporary and the sermon was by the pastor, Ray Still, in his sermon series entitled "What Would Jesus Tweet?" Judging by the number or cars and traffic at closing, they have a sizeable congregation. < < Oakwood Baptist Church. After lunch we went to the Museum of Texas Handmade Furniture. The museum is housed in the historic 1858 Breustedt-Dillen house. It housed a collection of German handcrafted furniture made by local craftsmen of the mid to late 1800's, including Jahn, Scholl and Stautzenberger. The docent guided tour also included the Cabinet Shop, Reininger Log Cabin and Breustedt Summer Kitchen. < < Museum of Texas Handmade Furniture. 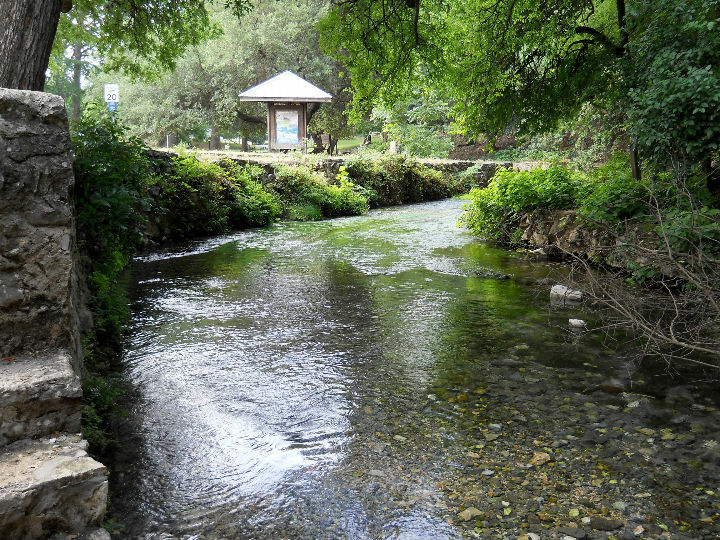 [Monday] In the morning we went to Landa Park to see Comel Springs, the source of the Comel River. 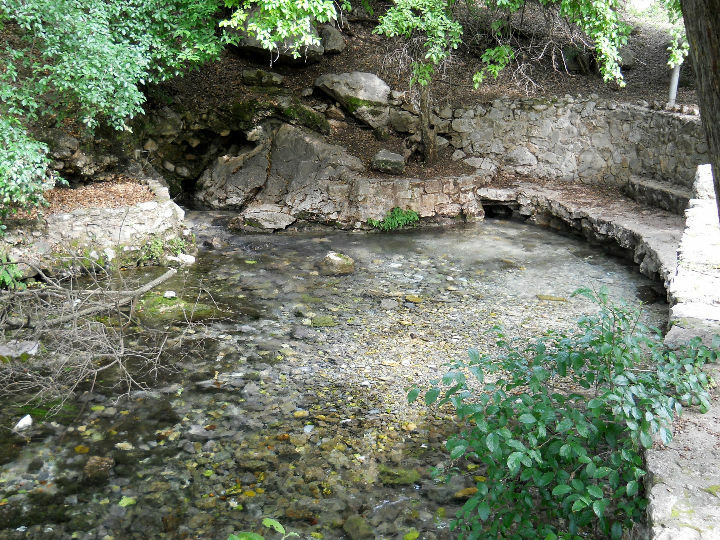 The springs are the largest in Texas and the Southwest. The Comel River is the shortest river in the world. The park borders the river and has paddle boats and a miniature railroad train. Much of the park was constructed in the 1930's by the WPA. < Comel Springs < Comel River from the springs. At 11:30 we met a docent at the Lindheimer Home. 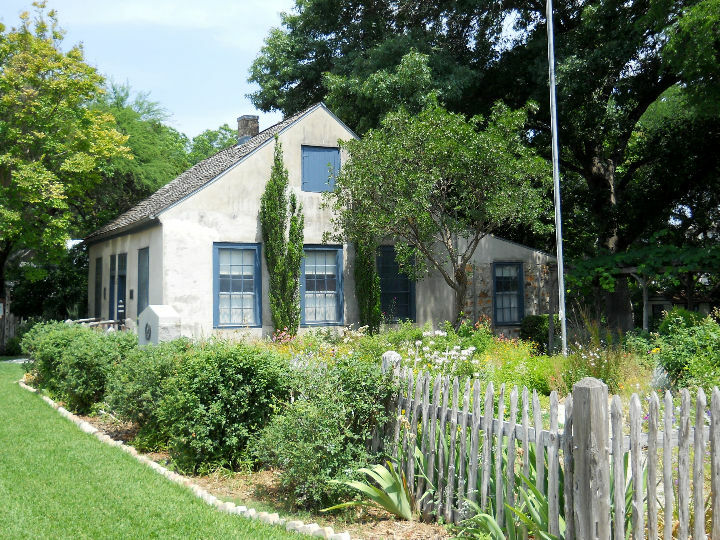 It was the home of Ferdinand Jakob Lindheimer (1801-79), the first to classify much of native Texas flora. 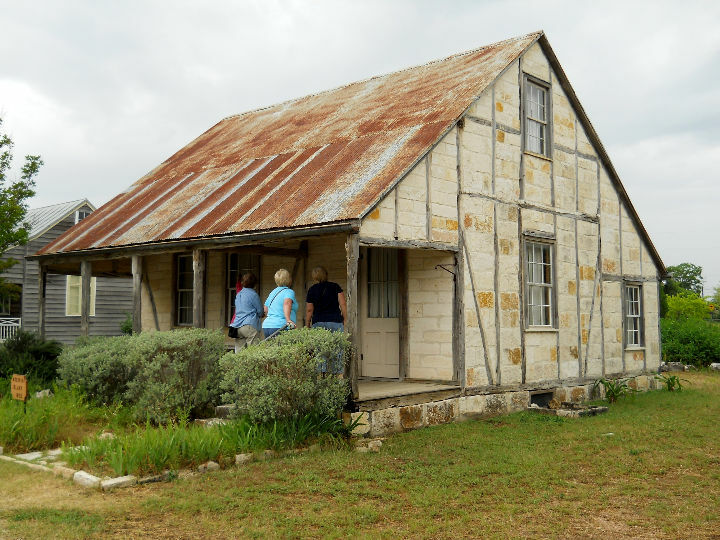 The house, circa 1852, displays the fachwerk construction German settlers adapted to Texas cedar and limestone. 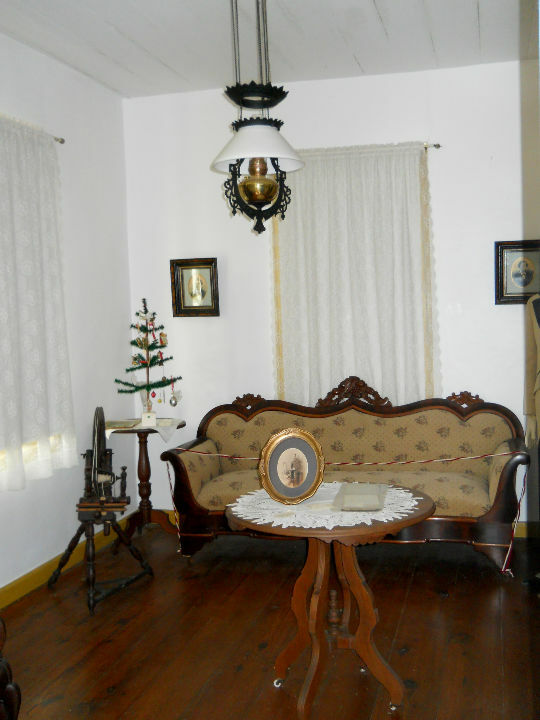 The home has many original furnishings. The garden is maintained by the master gardeners of the city. 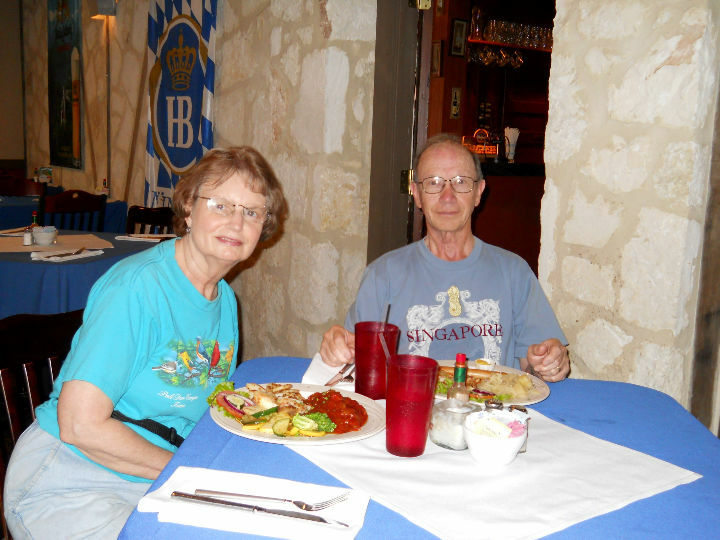 We ate lunch at Friesenhaus Restaurant, one of the authentic German restaurants in town. The food was sehr gut! 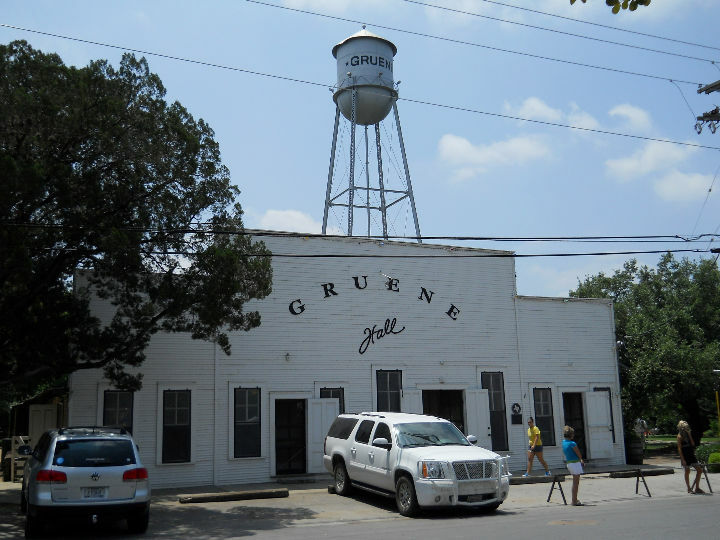 After lunch we drove to the historic town of Gruene, TX. 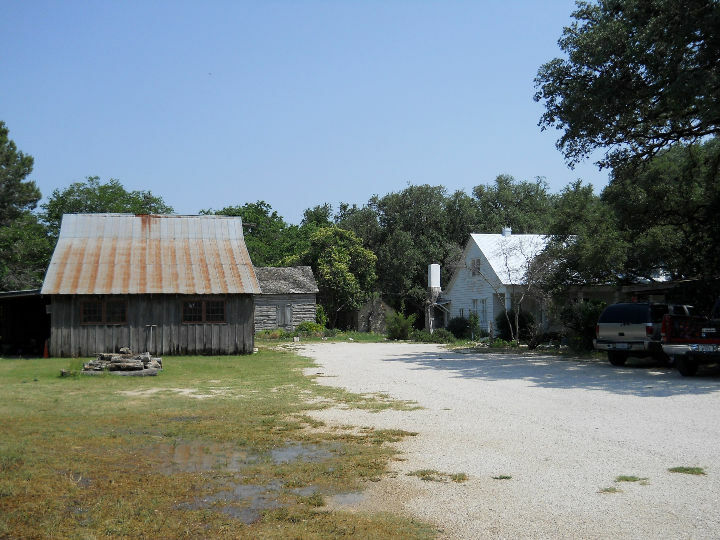 German immigrants established this village on the banks of the Guadalupe River before 1850. 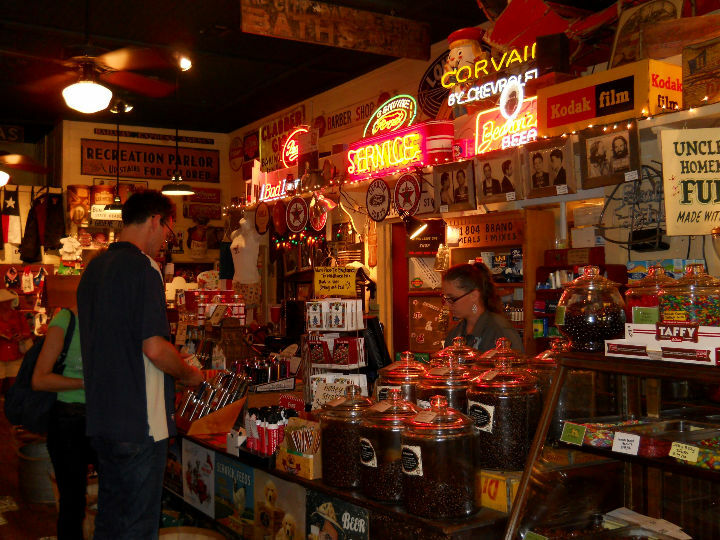 Historic structures have been restored and now operate as shops, restaurants, bed-and-breakfasts, river outfitters, and art gallery and a winery. 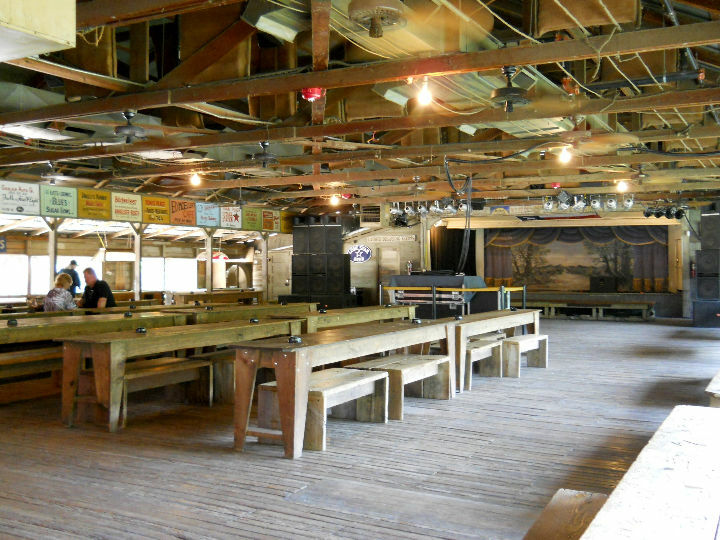 Gruene Hall, built in 1878, is Texas' oldest continually operating dancehall. 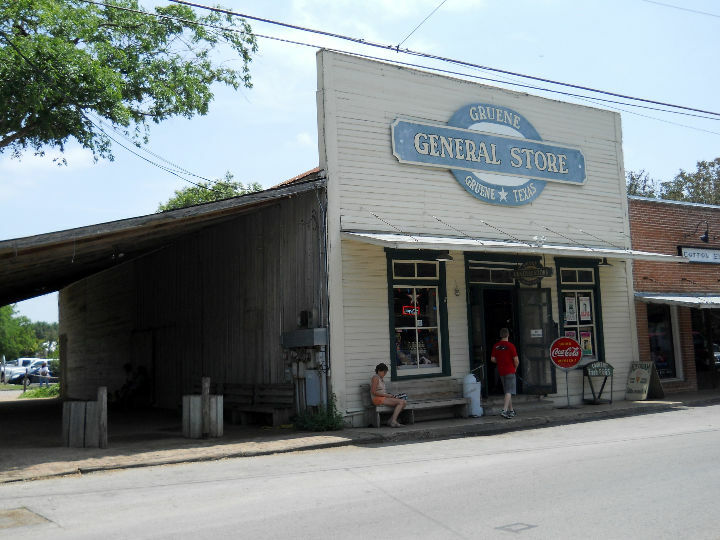 < < Gruene General Store. 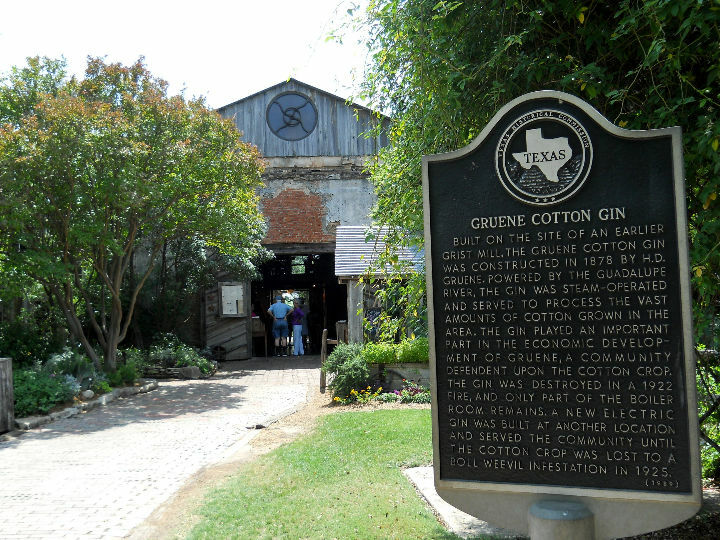 < Gruene Cotton Gin Restaurant. 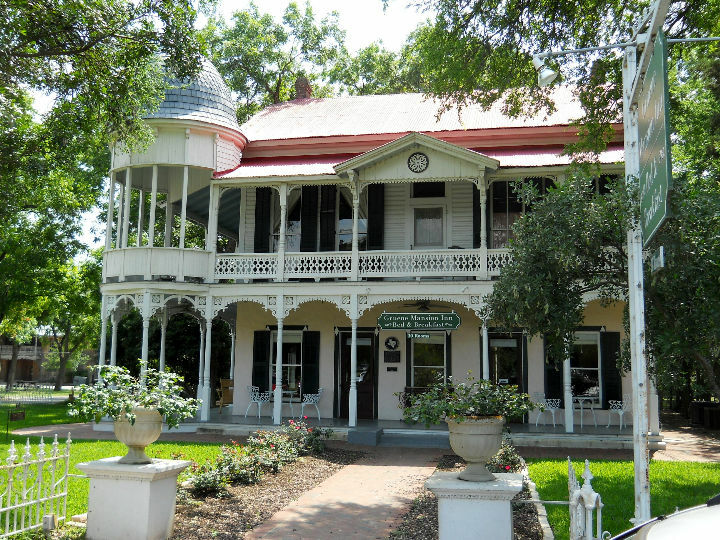 < Gruene Manson (c. 1872) bed and breakfast. When we got back to the trailer, we had a note taped on the door from the Park office informing us that the area was under a flash flood watch tonight and tomorrow. They requested that we make ready before bedtime to make a quick retreat from the park in case the Guadalupe started to flood into the park. A large area of storms were located to the west of New Braunfels at this time. We connected the truck to the trailer, just in case. [Tuesday] We checked the weather radar after hearing a few raindrops on the trailer. A large area of rain was about 70 miles west, headed our way, so outside activity would need to be early today. 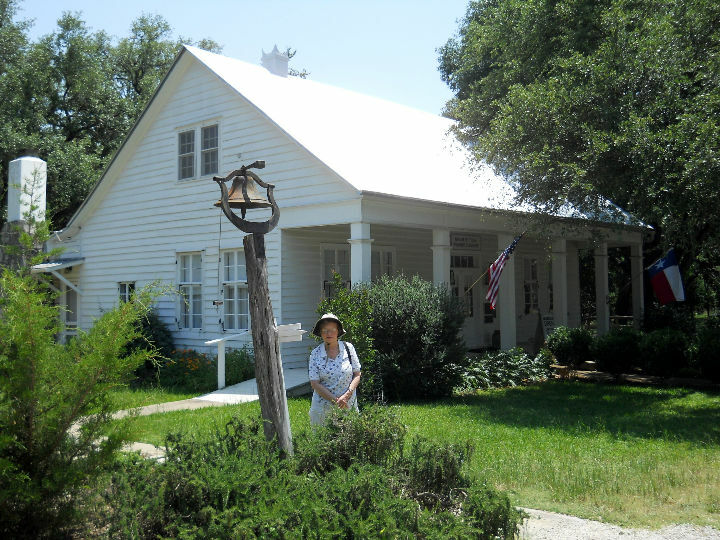 We decided to go to the Conservation Plaza to see a village of historic New Braunfels fachwerk homes on tour. Our docent was very knowledgeable and quickly escorted us through almost a dozen buildings in the 45 minutes before the rain moved in. Fortunately we were able to see everything. < The Jahn Haus (c. 1855). < A New Brunfels Sunday Haus. < The Moehrig-Blank Ranch Haus (c. 1855). After lunch we drove downtown to see the Buck Horn Barber Shop and Museum. It is a working barber shop with a collection of miniature handmade circus items made by Fred Wagenfuehr in the 1960's. 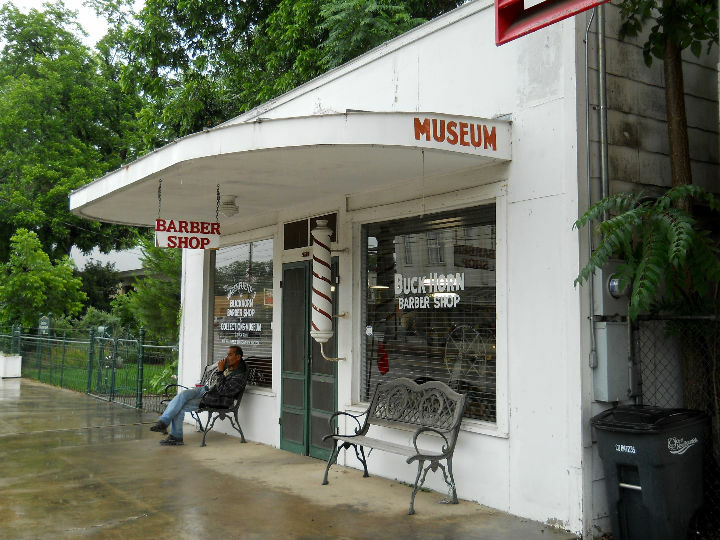 < Buck Horn Barber Shop and Museum. 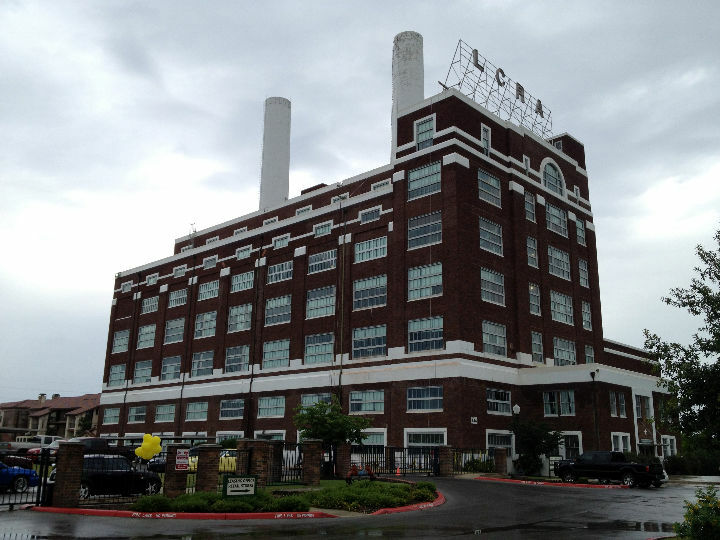 Next we drove a few blocks north to visit The Landmark, a historic conversion of the Comal Power Plant into Residental Lofts. 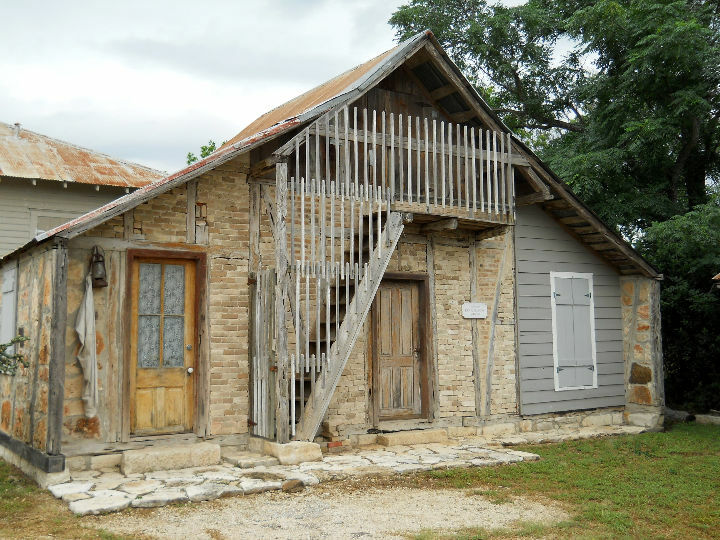 The building originated in 1925 as a hydroelectric power plant, supplying power not only to the New Braunfels and San Antonio area, but to every power grid east of the Rocky Mountains. In 1927, it was the largest power plant in the world burning pulverized lignite coals as fuel, and switched to natural gas in 1928. The plant continued to serve the community until it ceased operations in 1973. 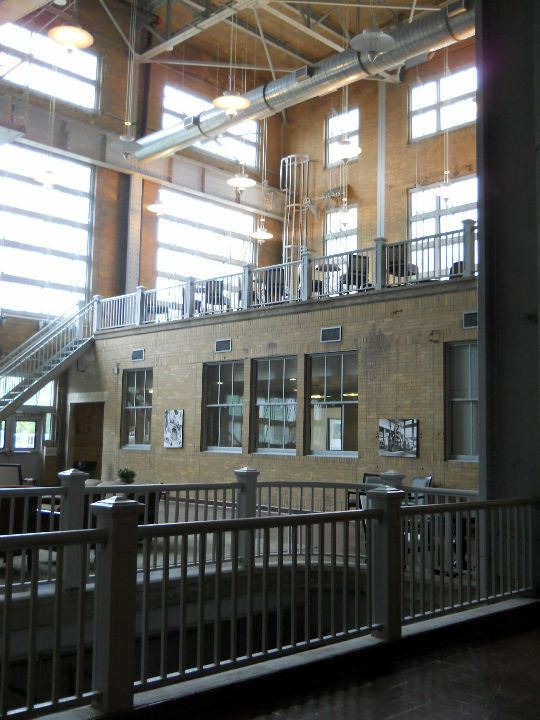 After sitting vacant nearly 30 years, the LCRA performed an environmental remediation on the site and building. 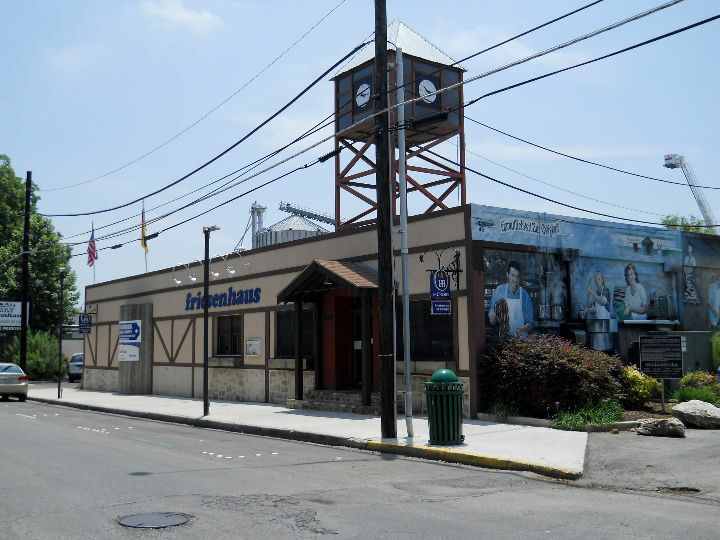 Upon completion, the Larry Peel Company purchased the building to renovate into lofts and build garden apartments on the surrounding grounds. The Comal Power Plant building is listed in the National Register of Historic Places by the U.S. Department of Interior and has received Recorded Texas Historic Landmark designation by the Texas Historical Commission. < < Comal Power Plant. 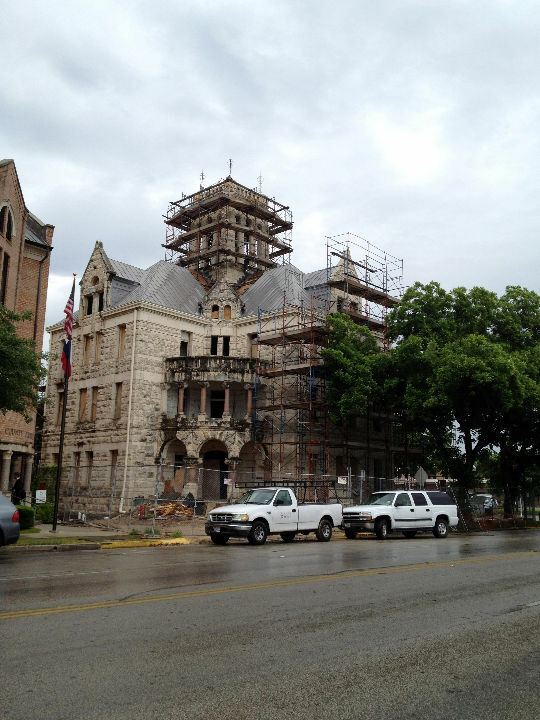 We drove back by the Comal County Courthouse, which is under an extensive renovation. It should look very nice once they are finished. [Wednesday] We pulled up stakes after breakfast and started our journey back to Richmond. We arrived home in the early afternoon. This draws to a close our visit to New Braunfels, Texas. We hope you enjoyed the photos and brief descriptions of our activities. God willing, join us again soon for another RV adventure.